Christine works in schools to encourage children to develop their autobiographical writing... and she manages the project from planning to publication. A professional journalist for 30 years and author of her autobiography, Why Do Monsters Come Out at Night? she helps pupils formulate their ideas and get them down on paper, both in writing and as artwork. Christine edits the pupils' work and produces bright, colourful, high quality and accurate individual 20-page books. A compilation of the children's stories is often produced for the school. She can also handle newspaper, radio and TV publicity for the launch of the books. Christine has worked with children from as young as four up to secondary school age. Many of the children have been bi-lingual MEA pupils, with English as their second language. Sessions last for an hour per week, and run for six weeks. They can be incorporated into school time or run as an after-school club. Christine travels within a 60-mile radius of Thirsk, North Yorkshire, for weekly sessions and further afield for one-day workshops. Please get in touch to discuss your school's needs, get a quote and see examples of previous books. "I worked with Christine in 2012 on a "Pupil Voice" project in Selby and the whole exercise proved to be an unqualified success. The children's confidence and written and spoken language improved dramatically. The project culminated in them being presented with a professionally produced copy of their book. Christine built up a wonderful rapport with the children. I cannot praise her enough for her innovative work, energy and professionalism." Robert Watson, MEA Specialist Teacher, Selby CP School. 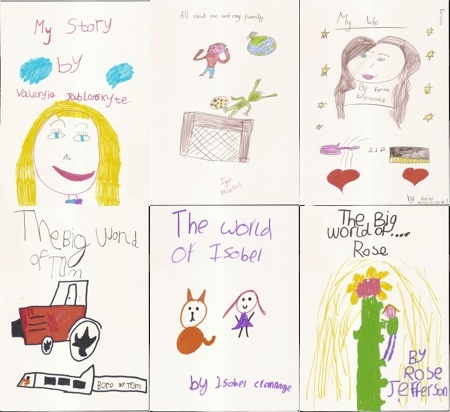 "Christine Fieldhouse worked with 14 bi-lingual pupils at Grove Road Primary School in Harrogate for 6 weeks, inspiring them to write about their own lives in two countries. The responded very well to Christine's friendly, easy and encouraging manner. Christine played a huge part in the great success of this project, encouraging pupils to talk about their lives with their parents and to promote a desire to write." Heather Stocks, MEA Specialist Teacher, Grove Road Primary School, Harrogate. "I would unreservedly recommend Christine to any school. She has an excellent rapport and a very calm manner with the children, and she offers exciting, well-suited activities, which reward her with the children's undivided attention." Christine Gabbott, Head Teacher, Pickhill CE Primary School, Pickhill, near Thirsk. "Christine led a writing workshop with a Year 7 low ability class and the children loved it. They produced work of an extraordinarily high standard. She communicated brilliantly and ensured the children kept on task. I would recommend Christine to any school. Her workshops are brilliant." "My daughter Rose's book is a real treasure and it's given her the confidence to write, write, write!" "I am so proud of my children and what they have produced. Their books are such lovely keepsakes. I also got copies for their grandparents and there wasn't a dry eye in the house on Christmas Day!"